Over the last few years, inequality has become an increasingly important topic in global debates about economics and politics. The Occupy Movement helped put it on the agenda, Thomas Piketty’s best-selling tome renewed intellectual interest in the subject and around the world average citizens say it should be a major priority. Statistics on the gap between rich and poor around the world are stunning. Crédit Suisse says people with a net worth of more than $1 million represent just 0.7% of the global population, but they have 41% of the world’s wealth. 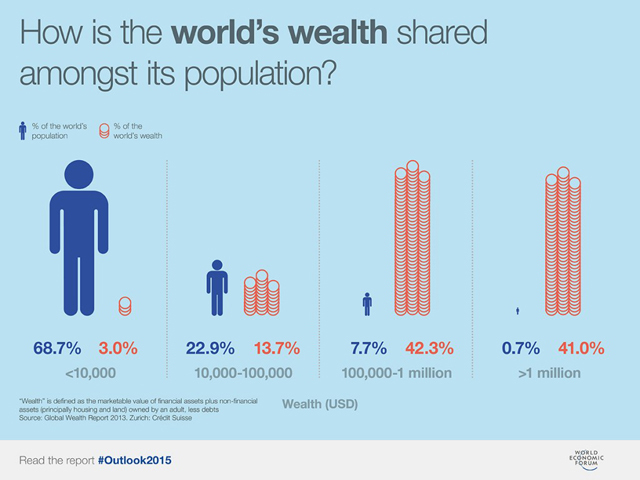 Meanwhile, those with a net worth of less than $10,000 represent 69% of the population, but just 3% of global wealth. A new report released by the World Economic Forum, ranks rising inequality as the top trend facing the globe in 2015, according to a survey of 1,767 global leaders from business, academia, government and non-profits, many of whom are gathering this weekend in Dubai. A recent Pew Research Center survey highlights the extent to which people across the globe agree that inequality is a serious challenge. 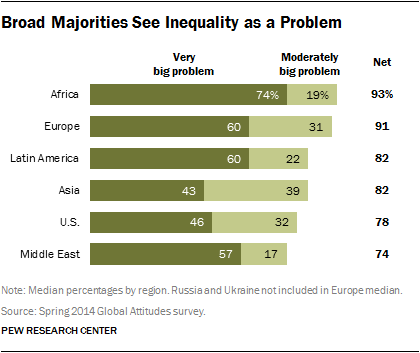 In all 44 nations that we polled, majorities say inequality is a big problem facing their country, and majorities in 28 nations consider it a very big problem. Concerns about inequality are widespread in nations that were deeply affected by the Great Recession. For instance, more than seven-in-ten in Greece (84%), Spain (74%) and Italy (73%) say the gap between rich and poor is a very big problem. However, even in emerging and developing nations that have experienced economic growth in recent years, there is a consensus that those at the top are reaping the financial benefits of growth, while others are being left behind. Who or what is to blame for inequality? People in our survey identify many culprits, but the top offender is government. Across the 44 nations polled, a median of 29% say their government’s economic policies are the most important reason for the wealth gap; 23% blame the amount of workers’ wages, while somewhat fewer blame the educational system, the fact that some work harder than others, international trade or the tax system. Widespread concerns about inequality, however, are not leading people to reject capitalism. Majorities or pluralities in 38 of the 44 countries we surveyed say that most people are better off in a free market system, even if some people are rich while others are poor. Still, as the Pew Research and World Economic Forum surveys make clear, both average citizens and elites are not entirely satisfied with the current economic status quo, and in particular with the degree to which everyone in society is able to enjoy prosperity.